Sleep and I rarely get along well. I’m a long-standing insomniac with morning classes, and this usually results in me being pretty dead on my feet. My alarm clock is situated across the room to prevent me from hitting “Snooze” so easily, but this too seems to be of little consequence. 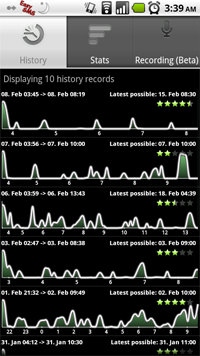 Android’s decided to help me out, though, with an app called “Sleep as an Droid.” Grammatically-incorrect title aside, it’s a very robust alarm clock and sleep tracker: there’s a number of features that set it apart from the stock clock, and make it worth looking at if you’re interested in the way you sleep. Most prominently featured is the sleep tracker: each night, before sleeping, you can put the app into a mode that reads from your phone’s gyroscope. You’ll then lay your phone on your mattress and begin to sleep. The app will then track your movements in the night and plot them on a nice graph for you to see: times of inactive movement are referred to as “deep sleep” (or rapid-eye-movement cycles) as opposed to times when you’re more active. Settings within your alarm configuration make it possible for you to be woken up during a period of light sleep, making it easier to get out of bed. Upon waking up (to a pre-set alarm or otherwise), one is asked to rate that night’s sleep on a five-star scale, and add any comments if they wish: I’m usually quite groggy, and usually don’t bother typing anything out. Doing this on subsequent nights can yield interesting results, though. One can see comparisons of nights across a span of time, and measure exactly how much sleep they’ve gotten. An “ideal sleep range” can be set (measured in hours) within the preferences menu so the app can tell you your cumulative sleep debt. If you have an alarm set, the app will also notify you when it’s time to go to bed in order to get those 8 hours you’ve been craving. This app is useful for data freaks like myself who enjoy seeing things visualized: it’s interesting to see nights where I sleep quite soundly, but end up feeling like garbage in the morning regardless. There’s also a function to use the phone’s microphone as an anti-snoring monitor, but I haven’t explored that yet: as I leave my computer running during the night, I don’t want it setting the vibrating “snore alarm” off prematurely. Other than that, it’s a fairly competent alarm clock. You can set music on your SD card as a wake-up call, but it requires an outside file viewer (Handcent SMS works, weirdly) to choose which song you’d like. Fine-tuning options like requiring a math question to turn off the alarm helps with snooze button abusers like myself. 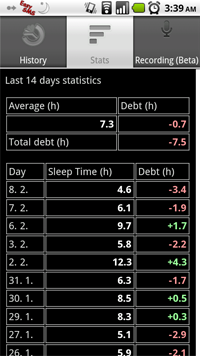 I’ve been using this app for a couple weeks now, and the screenshot above shows roughly one of those weeks; these data points can be posted to Facebook from the app itself, but I doubt even my friends are that curious about my sleep patterns. Give it a try and see what your sleep schedule’s like: I doubt too many Droid Life readers are 4 A.M. night hawks like myself. Sleep as an Droid is available for free as a two week trial. It’ll cost you $1.35 for an unlock key after that. Matt Demers is Droid Life’s app guy, and would love to get back to a normal sleep schedule. The Internet makes that hard sometimes. You can find him on Twitter and get ahold of him via e-mail. Qualcomm Introduces 2.5GHz Quad-core Mobile Processors, Holy Sh*t! HTC Thunderbolt Ads Take Over the Internet, Announcement Finally Coming?